I’d love to be a tutorial seeker! Here are some examples of my own tutorials: http://tousebothsyllables.deviantart.com/gallery/34576080 and I know of a lot of really good-quality tutorials by others to link to as well. I would love to write reviews, too, and I could be honest and objective without being hateful. Unfortunately I don’t have a sample review ready right this minute but I could write one for you if you’d like! 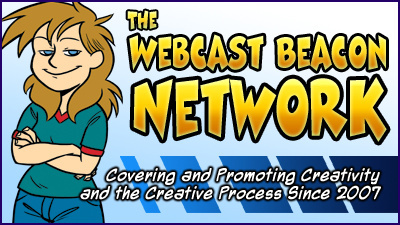 For a small while, The Webcomic Beacon Newscast was doing “Deviant Art Tutorial Grabs”. There were more or less a random assortment of tutorials. DA Tutorials are really not something we could ever re-post. The nature of the tutorials just would not work like that. But Yeah, putting together compilations (links and summaries), of like tutorials, would be a great step in the right direction. It may be a bit challenging, and may work best by making several lists at once as you browse? Not sure, but if you want to give it a shot, I’d be more than happy to see what you can come up with! The "catch-all" podcast for audio contributions for The Webcast Beacon Network, that don't fall into any existing WCBN program or show.